LinkedIn, the go-to social network for professional development, employs a world-class team of user experience researchers. reached out to our research expert, David. Switching software platforms on your employees is never an easy undertaking. But when you use research to gain an understanding of your users and their needs, it can make the transition less difficult. We created a test case and training for a new research framework for a LinkedIn business unit to apply to users around the globe. What did we do, and how did we do it? We started with a user research test case around the current solution. Our plan was straightforward – identify pain points to address and identify functionality that users would not want lost in the transition. The end result? 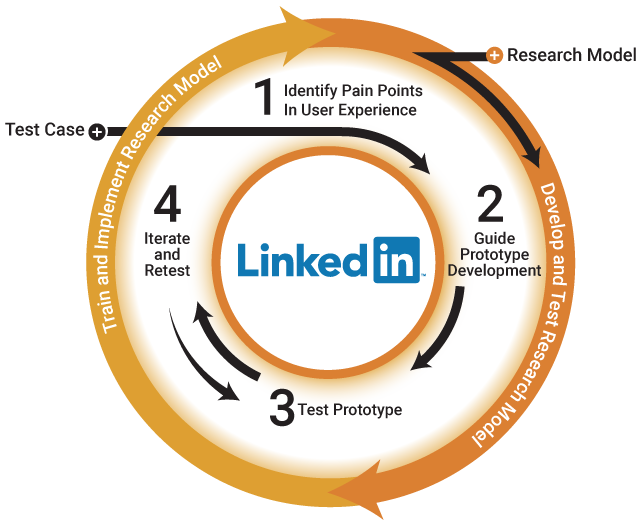 LinkedIn has new and trained research advocates outside the UER group, and user feedback is driving prototyping and development activities in an enterprise-wide software transition. From there we worked with product owners to create and test prototypes, through an iterative process, while testing a variety of modes of inquiry – observations, interviews, dyadic interviews, focus groups, co-creation and more. Once the team arrived at alpha-ready concepts of our test case and David identified the most fruitful modes of inquiry, he created a research seminar and delivered training and research templates to non-researchers to give them the confidence and skills needed to begin collecting insights of their own. We started with a user research test case around the current solution. Our plan was straightforward – identify pain points to address and identify functionality that users would not want lost in the transition. From there we worked with product owners to create and test prototypes, through an iterative process, while testing a variety of modes of inquiry – observations, interviews, dyadic interviews, focus groups, co-creation and more.